After a short drive from the country manor to the church Daddy to had to leave us to do "best man" duties. I had to try and keep the girls out the stream which they usually paddle through when we visit, and keep them looking white ivory until it was their time to go in. 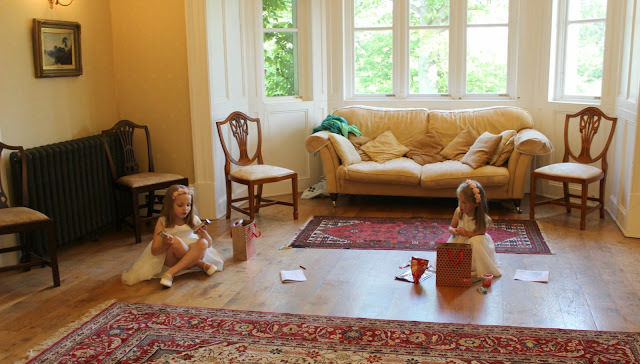 Which was just before the bride and groom.... after everyone else had sat down and got comfy. How hard could that be?? They decided to play on the old bridge that crossed the stream and play poo sticks and throw stones to watch them splash instead. They looked picture perfect sat under the pure blue skies surrounded by the greenery. Then J noticed the rope swing was still on the tree. That was it. There was no way I was stopping her. Her eyes were fixed and the speed across the ground was record breaking. I crossed my fingers and prayed it was clean and dry so it wouldn't mark. It passed the time though and kept the girls amused whilst everyone was seated. I was then asked to take my seat. The look on J's face says it all.... (Sorry Auntie R and Uncle N, J thinks it was her day!) They were so proud to walk them down the aisle. They then sat on the pew in front of us and listened to the full service, and attempted to sing the songs from the book. Even the vicar commented during the service how well they were doing, along with a Dr Who joke. On leaving the church we found we were trapped in the church grounds. 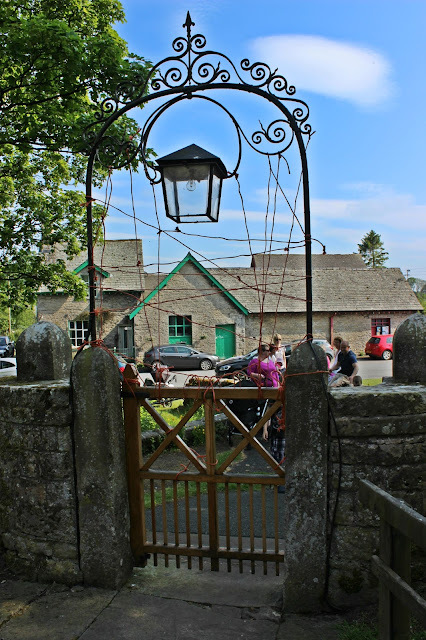 The local village children had 'locked' us in by tying string all around it. Thankfully we knew this would happen as its a local tradition. The tradition goes that you are 'locked in' until you pay the village children. The bride and groom then threw some change through the gate before we cut our way through it. The girls found it hilarious. 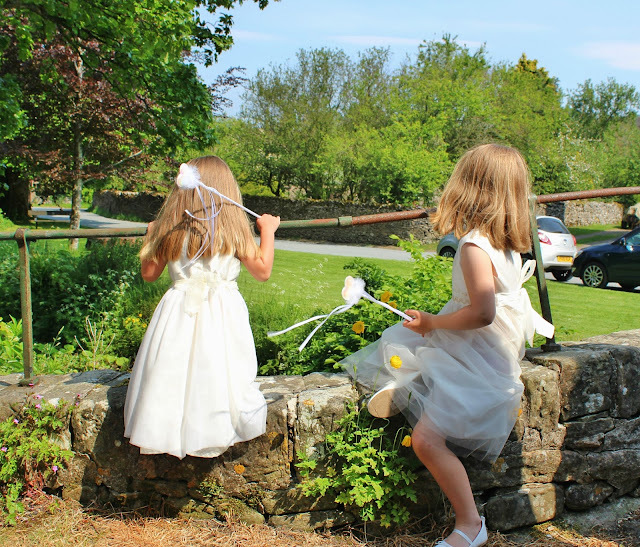 Some wedding guests didn't realise it was tradition and thought the village children were naughty. Whoops! After we were through the gates the girls could throw the confetti. I wish I had brought more then one box as again they LOVED it. We also shared our confetti so everyone could throw a bit over the happy couple. J went a little hyper with it and tried putting it down Auntie R's dress. Eek! Whilst photos were being taken the girls opted for the rope swing again, this time I could relax as the main part was over. S wanted a go this time however as soon as she sat down she pinched her skin and cried. Only Haribo could take away the pain. 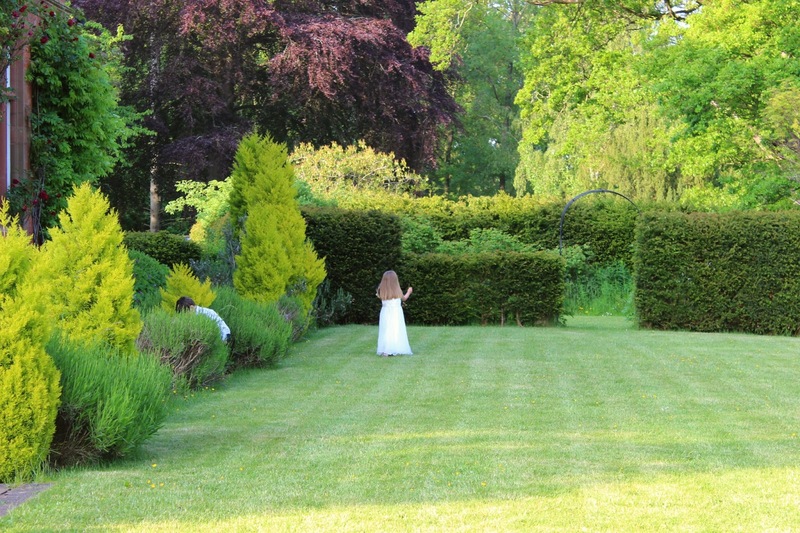 Once we arrived back a the country manor it was time to mingle with prosecco and canapés. Knowing the children wouldn't like the posh grub we organised "snack bags" for the children with some activities too. They took the huge room and made themselves comfortable whilst tucking in. S soon wanted to be back outside and ran free. She wanted to look for the deer that was spotted earlier that morning. After the drinks reception the girls wanted to get changed. S chose another Ivory dress, this time a longer one with lace detail, whilst J wanted something that would 'twirl' when she danced. 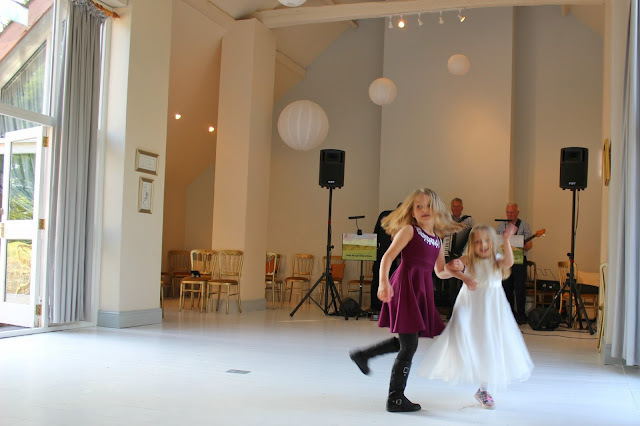 Whilst the cake was cut and more drinks were poured the girls took advantage of the empty dance floor. 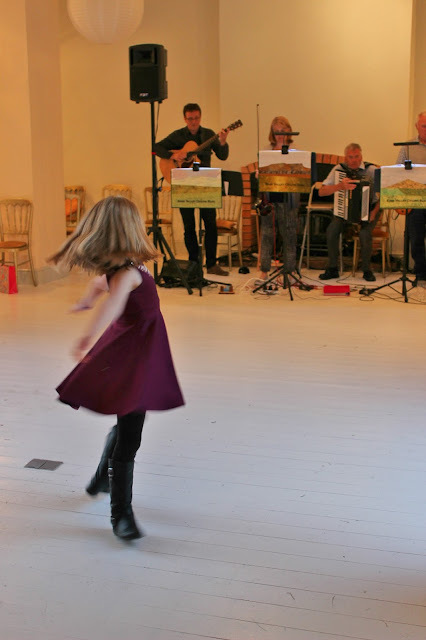 J danced the night away with the ceilidh band and the other guests happily danced with her. S didn't want to dance as it was too structured. However she did do a couple with us all. Instead S had us running around after her. She ran free. Enjoying the evening sun and the warmth it brought. However with a swimming pool on the grounds and alcohol flowing we had to keep her in our sights at all times which meant we didn't really socialise as much as we wanted. 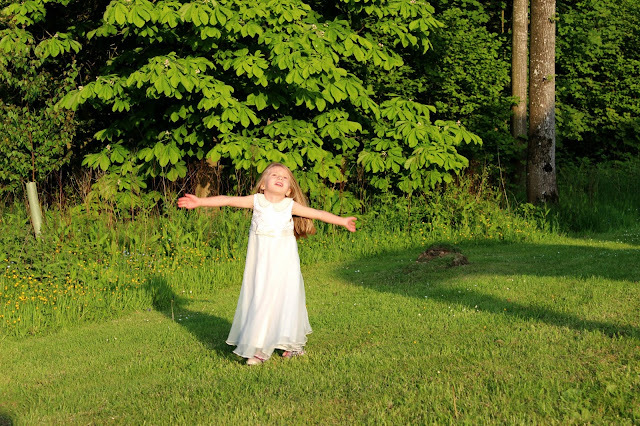 She was happy though, enjoying the moment, enjoying the birds.. enjoying the atmosphere. Dancing her own dance to the music which seeped outside. After all the dancing and drinks it was time for dinner. No country wedding is complete without a hog roast. The girls had never seen a hog roast before. S was captivated by the bones. Being the girl who she is, and which we all love and adore as its so unique, she asked the lady if she could have a bone. My jaw hit the ground. I started apologising instantly. The lady asked me if it was ok and then handed her not just one bone... the ribs, then followed another much larger bone. Thankfully it was mostly family and close friends at the wedding and they found it hilarious that the sweet girl was playing with bones. We eventually managed to prize her away from them and a family friend 'hid' them away. This left the rest of the evening to more dancing, drinking, socialising and watching the sun go down celebrating the new additions to the M family. 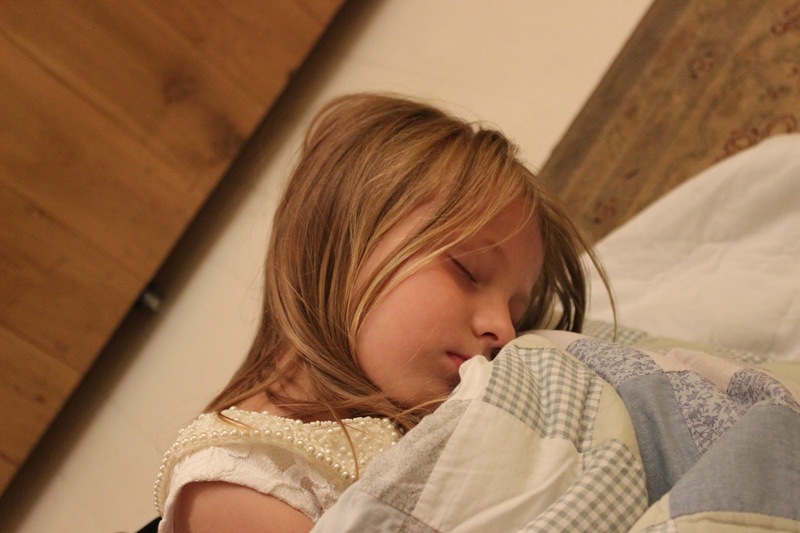 S eventually sat down on my lap and fell asleep. I wont mention that this happened at 11pm, but I will mention that it meant that I could enjoy a glass of wine in the last hour I was 29. Result. That sounds like a wonderful day, love the local tradition too! 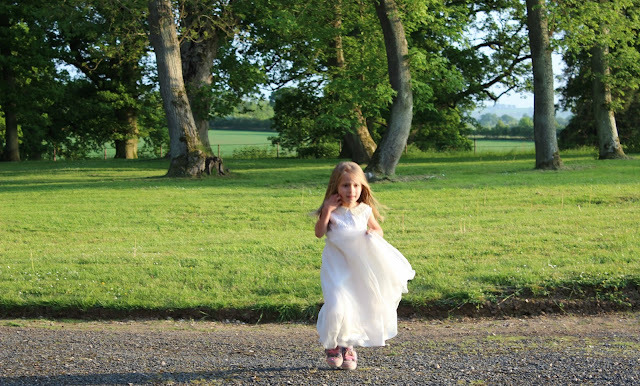 Gorgeous shots of the little ones - my favourite is the sunset photograph at the end. Stunning! Omg they are beautiful! Can they be in my wedding too? haha! What a lovely day you all had. 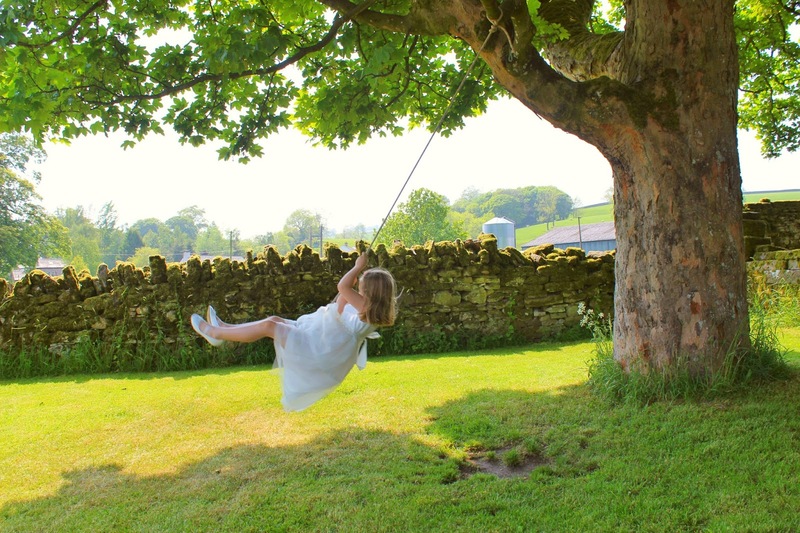 I love the tree swing - my eldest would love that. How funny that some of your guests didn't know about the local tradition - I bet that made for some funny conversations at the reception! They look confidently adorable! I could feel how J enjoyed the rope swing. How adorable are they?! Super photos of a wonderful time. 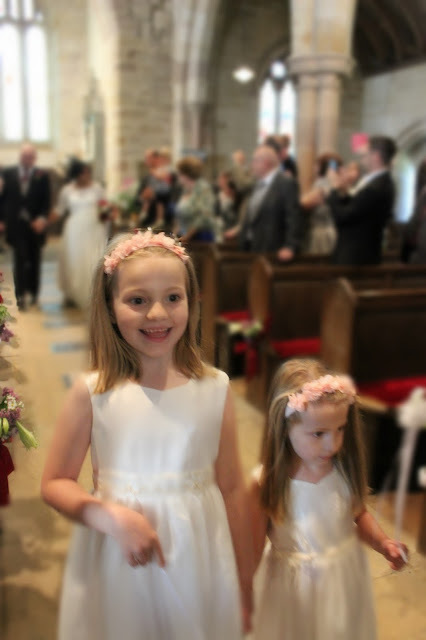 What a fabulous day for all of the family, weddings are always so beautiful and I'm sure the girls will remember it as 'their special day' as well. 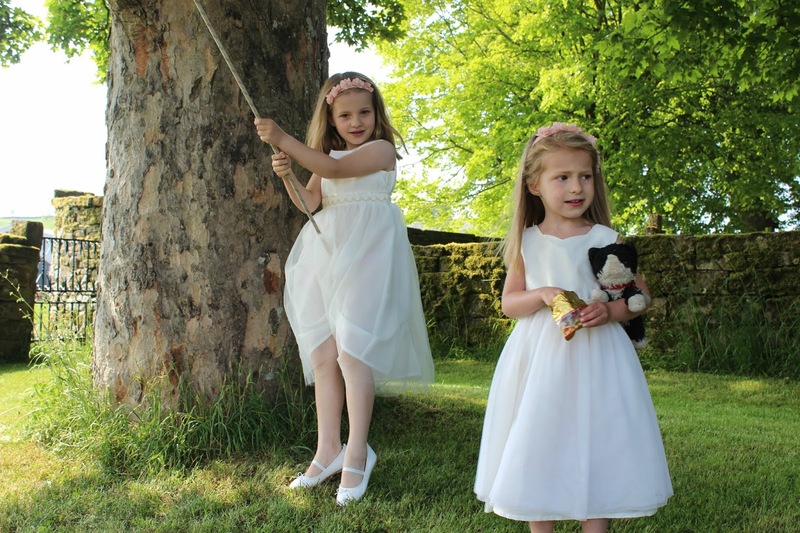 It's great that you and their Auntie R thought about all the things the girls would need to keep them out of too much mischief and wands instead of flowers is an inspired idea. 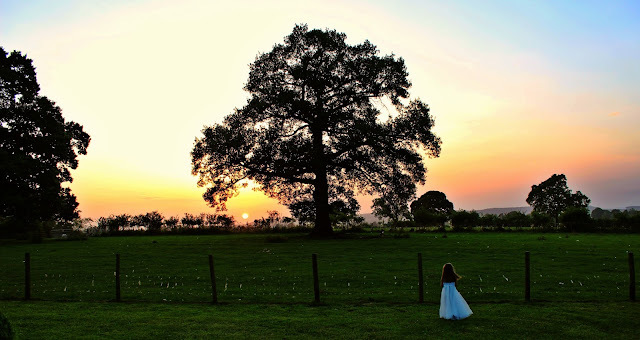 The grounds of the estate are beautiful,watching the sunset over the rolling hills must've been magical. The girls look like they had a fantastic time, I'm sure they'll be talking about this for years! They both look so cute - I love their dresses. What a gorgeous set of photos. The girls look positively angelic. Awwwh, how cute! 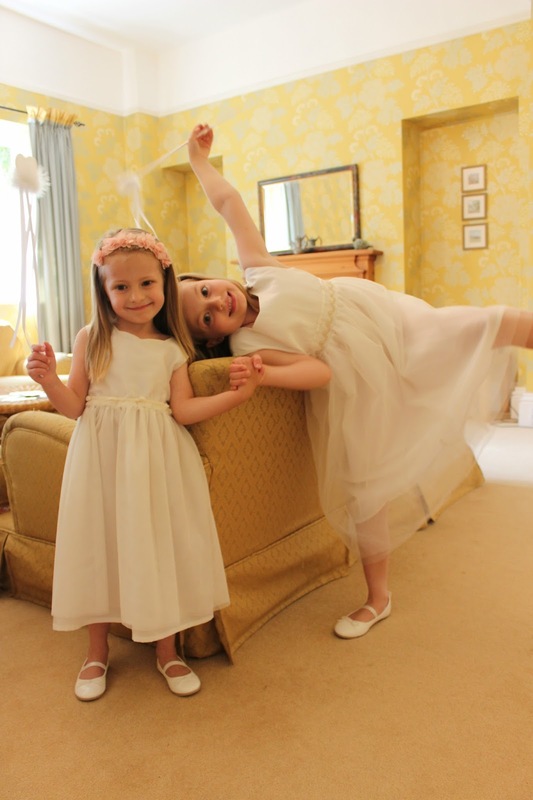 Those flower girl outfits are just adorable! The photos you have from this wedding are so precious! 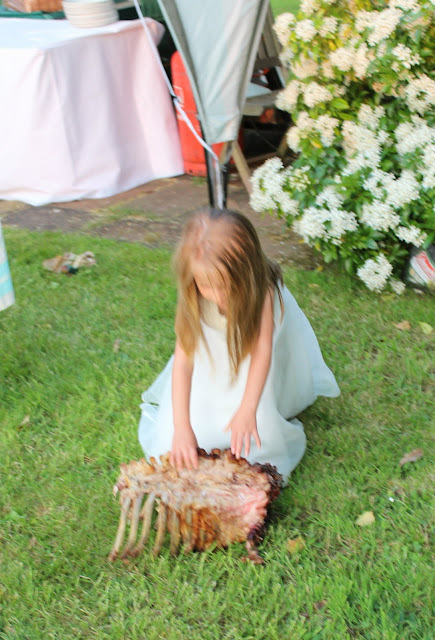 Looks like she had a great time with the hog roast bones lol... the simple things that please kids hey! Stacey never got to be a flower girl when she was little unfortunately, but she's going to be a bridesmaid for the first time next year. She's so excited. Especially as it's the day before her 14th birthday! Gorgeous girls and I love their dress. I'm sure you all had a lovely time.